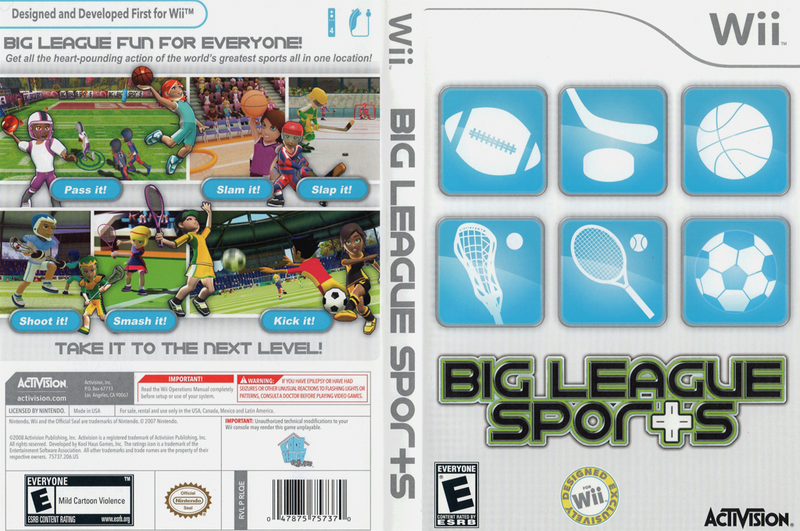 synopsis (EN) Big League Sports for Wii offers instant access to the most action-packed moments in sports. The result is a title with a singular focus on putting you in the most thrilling situations while competing in your favorite sports. Six sports are represented for a combined total of 22 events, each using instinctive controls that mimic real athletic movement with the Wii Remote. Each sport -- tennis, basketball, football, soccer, lacrosse and hockey -- has its own kind of "hit the shot at the buzzer" style of heart-pounding action, and this is exactly what Big League Sports captures. synopsis (ES) ¡Diversión deportiva para todo la familia! Vive la acción palpitante de los mejores deportes del mundo: fútbol, baloncesto, hockey sobre hielo, lacrosse, tenis y fútbol americano. ¡Levántate del sofá y lleva la emoción a un nuevo nivel!